My first introduction to The Thirty-Nine Steps was through the 1935 Hitchcock thriller, The 39 Steps, starring Robert Donat and Madeleine Carroll. It’s one of my Dad’s favourite films and I remember the excitement of Richard Hannay escaping north from London, evading capture at the Forth Bridge and trekking across the Scottish landscape to meet the man with the missing fingertip. The book never interested me until I found the paperback when staying at my Grandparents’ house. I read the book through in just a few nights, gripped by the adventure playing out in my hands. Reading the novel again, I’m taken back memories of family and the three generations of mine that have come to know the story so well. In fact, the copy I now own was bought by my brother. There cannot be a clearer definition of a timeless classic than a tale passed down, even indirectly, through family connections. No doubt in years to come, one of my children, perhaps even grandchildren, will take my battered copy from my shelf and continue the tradition. 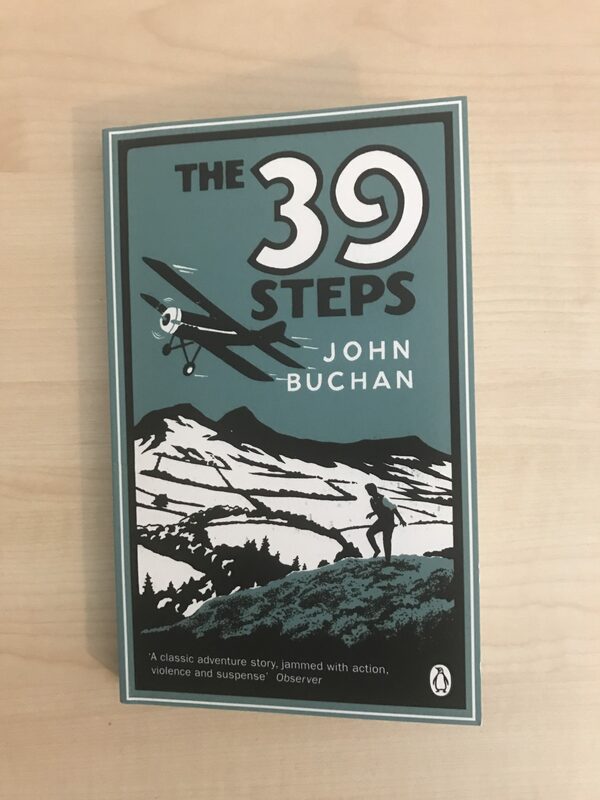 First published as a serial in 1915, The Thirty-Nine Steps is the first novel to feature the character of Richard Hannay, who would later star in four more stories by John Buchan. The story follows Hannay who, caught up as a bystander in a murder and spy plot, must evade capture by the authorities and criminal. Stretching from London to Scotland, the story is a breathless tale of a man on the run, with only his wits protecting him. The strength of the novel is its relentless pacing. As Hannay goes on the run, he moves from one chase to another, barely finding time to recover. The further on he goes, the more he stretches his look and the greater the tension builds as time ticks away. There’s a real sense of relief when he has time to sleep rough, but also fear of those on his tail catching up in the meantime. The Thirty-Nine Steps is an adventure novel in the purist sense of the term. It races and almost dares the reader to pause for breath, few will encounter the book and take more than a week to finish it. Despite being best-known for its plot, Buchan’s sense of character and landscape mustn’t be played down. In Richard Hannay, we have a likeable anti-hero, an ordinary man trying to do the right thing despite a country turning against him. His journey into Scotland takes in some of the finest examples of setting influencing and defining a novel in literature. The Thirty-Nine Steps is one of the Guardian’s 100 Best Novels. John Buchan wrote 29 books in a career that also included war propaganda, serving as a Member of Parliament and becoming Governor General of Canada. Best known for his adventure stories starring Richard Hannay, Buchan also wrote short stories and several biographies. Luke has read 1 book toward his goal of 24 books.